How many franchises could you grow across Australia? Home → Videos → How many franchises could you grow across Australia? These figures are from Peter, but approximately, if you’re thinking Brisbane, you can put in X number, so say 19, that means that, in total, around the country, you can pull in about 120 because that’s the equivalent pro rata that works out around the country. If you say I’m in Perth, I can do 12, but then Sydney is probably about three times that. This is a bit of an idea, a bit of a guess. If we look at a typical city and let’s say it was 19 and we’re looking at Brisbane, you might put 4 in the first year, you might get 9 in the second, maybe 3 in the third. So by year three, you may have 16 territories done. I’m not suggesting you got to grow that rate. It’s just to give you an idea because what I’m going to ask you to do is actually to go to Page 17 and we’re going to have a look at an example you can do. In our case here, we have the example which if you’d like to turn over to your page 17, you’ll see there are two little schematics there. One is the previous slide showing you the typical numbers around the country, the sorts of number of franchises that we have, that you’re likely to get to extend. This should give you an idea of what your scope is for your business, in very rough terms. Then you look at 9.4 which is represented on this slide here. We’re saying as example, maybe you said you’re going to establish 10 franchises of $ 20,000 each, which means in total, that’s $ 200,000 worth of revenue. If your fees are going to be running at 5, that means per unit, you’ve got 15,000 revenue and total fees from 5 sales of 15 is 75. Your gross income is going to be $ 275,000 in that year. What I’d like you to do is to put down here how many franchises you think you could grow in three years. You may put 5. On the right hand side, the accumulative, write 5. You might say, year 1 we’re going to put 1, year 2 we’re going to put 3, year 3 we’re going to put 1. Just put something down there as an indication for yourself; just to show the way that you can grow. 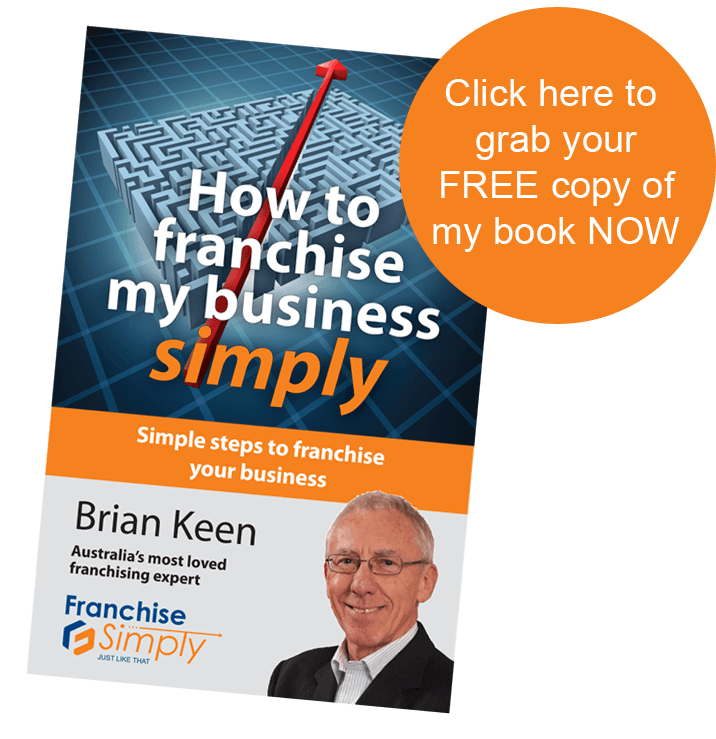 Question: How do you know how much your business is worth to franchise, to sell? You don’t know until you’ve done your budgets, but what we’re going to do is just take a random figure and say what you think. At the moment, you may think you can sell yours for 20 or a proportion of that. If you said you can sell yours for 30 and you think that you’ve got a capacity in Victoria, for example in your case, maybe you put 20 in, then put 20 down there as your accumulated sales and put 30,000 as your franchise fee. How many did I say in the state? Say it’s 20, times 30, then 600,000 is your potential gross from franchise income. What I’d like you to do is then put down how many you think you might sell in year 1, year 2, year 3. It doesn’t have to be the total. You could put a couple in the first year, a couple in the second, a couple in the third, or 2, 5, 10. It’s just to give you a bit of an idea. But bear in mind, once you start, it really accelerates because once you’ve got 2, or 3, or 4, you’ve got the processes in place and you can put new units on very simply. Put your training programs in it to help them induct very quickly. Your systems and support are there, and that’s when that’s all evolving and you’re putting staff members on or team people on to do that support for you. You’ll probably find as well you’ve got franchisees who’ll put their hands up and say, I’d love to get involved in the training or support. That happens quite generally. Just to give you a bit of an idea, put some numbers in there. Just put some across the top and then we’ll work down. We can also have a chat about this later on if you want to go through an example individually. Let’s kick off with this first one and say you’ve got two in the first year. Unit cost is 20, so that’s 20, so your sales is going to be $ 40,000. If you’ve got 5 people paying fees, and I said 5 because it’s an average, because one started it at the beginning of the year and another one started it at the end of the year. We’re breaking them down. You’ve got half of them paying in fees. The cost per unit in fees, the revenue is 15,000, so 5 times 15 is 75. So if you think your franchisees are going to pay you 10,000 a year for on-going fees and you’ve got two of them, Two 5’s is a 10, so 10,000. Your gross income will be the amount you got from sales, which in your case I think was perhaps 30,000 or maybe at 60,000. If you’ve got one there paying 15, you add the two together and you’ve got a total of about maybe 75,000 or $ 100,000. The idea is that’s a way for you to easily do a bit of an extrapolation, just to show you that it’s not actually beyond your ability to do that. It’s really fairly simple and straight-forward. Once you’ve got your factors together, you can work out how many you can likely do. The franchise fees, we’ll be touching on that again later so don’t worry. It’s just a rough figure pulled out off the top of your head. It’s just to give you an illustration and get you feeling comfortable in the space. But as you can see from the way that some of these groups grow, it’s very often the case. Once you get the ball rolling and your systems in place, people actually come to you and that’s what you’re aiming for, isn’t it? You get people coming to you without having to do heaps and heaps of mass advertising. Question: I have a question, just a guide to us, what different franchises are selling for in what range and do you have an example? We’re covering a recruitment section later where we’re going to a bit of that but the fact is, the market is pretty solid. Whilst it’s known, businesses don’t change hands immediately and franchises don’t always sell immediately. There is a healthy demand out there. We always found when times are tough, we sold more franchises, when we were recruiting as the Franchise Alliance. This was because there were more people coming out of the public sector as government was cutting back. We hear all the time that Telstra is putting people off. These are people often who are really good people and they will have some money. They say, ‘I’m fed up, we’re being made redundant,’ and ideally its people in middle age who’ll say, ‘I’ve always wanted to work for myself, I know better than the boss, let’s get a business. And the reason they’re attracted to a franchise is a lot of the things we’re covering here; it reduces some of the risks. So as far as they’re concerned, they haven’t got to spend a year doing research and risking this and that. Generally, it’s pretty healthy across all sectors, although some businesses are harder than others. The building industry I think at the moment will be quite healthy because a lot of people, particularly trades, get to their 40’s or early 50’s and really, they’re quite competent, they know what to do as far as running their businesses, doing their trade’s concerned, but in order to go the next level, they need the skills sets to be able to run a business and to get clients. A lot of them are really good trades people but getting work is a problem because they flat out with the contract, then they get to the end of the contract, and they spend a month looking for work and that’s traditionally the cycle that people go through in lots of businesses and professions. It’s a matter of finding the niche of where you’ll go to find your prospective franchisees.